Dovetail is a full service, woman-owned Cultural Resource Management firm headquartered in Fredericksburg, Virginia and serves the Mid-Atlantic Region. This month we are once again returning to our series highlighting the artifacts recovered from the Trogdon-Squirrel Creek site (31Rd1426/1426**) in Randolph County, North Carolina. Dovetail Cultural Resource Group conducted data recovery excavations at this site on behalf of the North Carolina Department of Transportation (NCDOT), guided by the data recovery plan authored by NCDOT (Overton 2014). Nearly 2,000 glass artifacts were recovered from the Trogdon-Squirrel Creek site with approximately 5 percent of the recovered glass shards definitively determined to be medicine bottles. At least 10 different medicines were definitively identified during the analysis of the site. Diagnostic Patent Medicine Bottles Recovered from 31Rd1426/1426** (Meyer 2011; Odyssey Marine Exploration, Inc. 2017). Archaeologically, patent medicine bottles include an incredibly diverse assortment of styles, colors, and sizes, and their content include a wide variety of concoctions. From bitters and tonics to sarsaparillas, a vast range of home remedies were available to the population for personal use. Remedies were often strengthened using ingredients such as morphine, cocaine, or opium but then sold to the public to cure anything from colic in infants to venereal diseases to “female complaints” (Hagley Museum and Library n.d.). Many of the bottle fragments found at the Trogdon-Squirrel Creek site contained large enough portions of embossed lettering to identify which patent medicine it contained, thus helping to more accurately date the site. Dr. King’s Discovery Patent Medicine Sample Bottle Recovered From Site 31Rd1426/1426**. Almost Complete “Ramon’s Nerve and Bone Liniment” Patent Medicine Bottle Recovered From Site 31Rd1426/1426**. Two of the recovered bottle fragments are sample- and full-size “Dr. King’s New Discovery” medicine bottles. This medicine, nationally recognized by the mid-1880s, was marketed as a cure for consumption, known today as tuberculosis (Meyer 2011). A circa-1907 ad even claims that the remedy is “the greatest life saver of all time” (Griffin 2013). Like so many other patent medicines of the time, “Dr. King’s New Discovery” contained questionable ingredients by today’s medical standards. A 1905 article by Samuel Hopkins Adams in Colliers Magazine warns, “As it is a morphine and chloroform mixture, ‘Dr. King’s New discovery for Consumption’ is well calculated to strike terror to the doctors or to any other class or profession, except, perhaps, the undertakers” (Meyer 2011). A circa-1907 Dr. King’s New Discovery Ad Claiming the “Life-Saving” Properties of the Remedy (Griffin 2013). A fragment of a “Mexican Mustang Liniment” bottle was also recovered from the site. Also dating to the latter half of the nineteenth century, this medication serves as yet another example of the supposed versatility of these patent medicines. Not only did they claim to cure almost any human ailment, one particular ad advertises that the medicine was to be used on animals and humans alike! 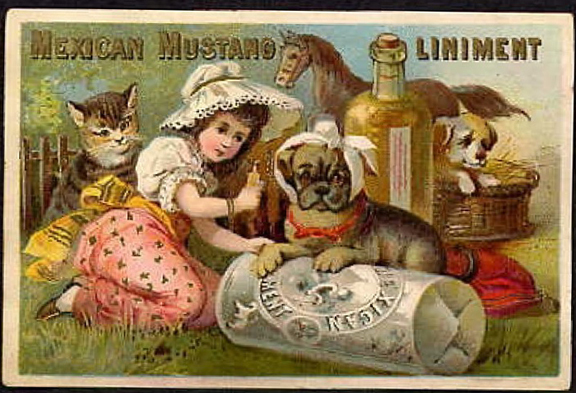 Another late-nineteenth-century ad for “Mexican Mustang Liniment” shows an oversized bottle of the medicine as well as a small bottle in a young girl’s hand. Ads like these are incredibly helpful to archaeologists as they often note the ingredients and uses of the bottle while also containing an image of the bottle itself. A circa-1880s Ad For “Mexican Mustang Liniment” Produced By The Lyon Manufacturing Company Shows That The Medicine Can Cure Both Horses And Humans (Meyer 2012). A Circa-1880s Ad For “Mexican Mustang Liniment” That Rather Helpfully Shows A Full Size Bottle Of The Medicine. Surrounding the bottle are a young girl and a number of adorable animals all presumably taking the “safe” medicine (Meyer 2012). Patent medicines very quickly fell out of favor with the public following the passage of the Pure Food and Drug Act in 1906 which required the listing of remedies’ contents. It is no wonder that the inhabitants of the Trogdon-Squirrel Creek site had so many different kinds of patent medicine bottles leading up to this act though; most medicines did not work to actually cure any disease but just masked the symptoms with a bad combination of drugs and alcohol. Luckily for us we do not have to take concoctions of morphine and chloroform (and who knows what else!) in order to cure common ailments today. Any distributions of blog content, including text or images, should reference this blog in full citation. Data contained herein is the property of Dovetail Cultural Resource Group and its affiliates. 2013 Dr. King’s New Discovery for Coughs and Colds, H. E. Bucklen & Co., Chicago, ILL. WordPress.com. Electronic document, https://oldmainartifacts.wordpress.com/, accessed May 2017.
n.d. History of Patent Medicine. Electronic document, https://www.hagley.org/research/digital-exhibits/history-patent-medicine , accessed June 2018. 2011 Peachridge Glass Website. Electronic document, http://www.peachridgeglass.com/, accessed May 2017. 2012 Peachridge Glass Website. Electronic document, http://www.peachridgeglass.com/, accessed June 2018. 2017 Odyssey’s Virtual Museum Website. Electronic document, http://odysseysvirtualmuseum.com/, accessed May 2017. 2014 Archaeological Data Recovery Plan: Site 31Rd1426, Randolph County, North Carolina. North Carolina Department of Transportation Human Environment Section, Raleigh, North Carolina. For hundreds of years the tourniquet has been used on extremities, primarily arms and legs, in an effort to stop hemorrhaging during an amputation. For this month’s blog post we are highlighting a Civil War-era tourniquet found during a recent archaeological survey in Henrico County, Virginia. This device is composed of cast brass with “Brinkerhoff” stamped on the handle. Leather fragments, representing the no-longer-extant strap, are present as well. Civil War-Era Tourniquet Recovered by Dovetail Staff During a Recent Archaeological Survey in Henrico County, Virginia. Van Wyck Brinkerhoff was a minor supplier of surgical instruments and medical sets during the Civil War and the tourniquet recovered by Dovetail was likely part of a larger set which would have included a bone saw, knives, bone forceps etc. (Echols and Arbittier 2016). The surgical set shown below (missing a tourniquet and forceps) was made by Brinkerhoff between 1860 and 1862 and illustrates the number of tools needed to perform an amputation. Civil War-Era Brinkerhoff Amputation Set (Medical and Surgical Antiques n.d.). According to Robert L. Mabry’s article, Tourniquet Use on the Battlefield (2006), the tourniquet is fundamentally unchanged from its original form when it was first used on the battlefield in 1674 (Mabry 2006). However, prior to this, Hans Von Gersdoff, a German surgeon, was a proponent for the use of tight bands around an amputation site, as illustrated in his book Feldtbuch der Wundtartzney (Field Book of Surgery) published in 1517 (Mabry 2006). Over the years, the tourniquet evolved as surgeons tried to find safer and more effective ways to reduce blood flow during an amputation while at the same time reducing the risk of causing nerve or tissue damage to the limb. In 1718 Jean Louis Petit created a tourniquet which included a strap and a screw device, similar to the one recovered by Dovetail, which could be tightened around the appendage thus negating the need for an assistant to hold the tourniquet in place (Welling and Rich 2012). During the Civil War amputations were a common procedure as the Minié Ball, a widely-used bullet in rifles during the war, caused terrible damage to the body. An 1879 description gives grim details of the extent of the damages caused by these projectiles: “bones are ground almost to power muscles, ligaments, and tendons torn away, and the parts otherwise so mutilated, that loss of life, certainly of limb, is almost an inevitable consequence” (Helmuth 1879). Approximately 60,000 amputations were performed during the Civil War, some done with no anesthesia (U.S. Library of Medicine 2013). This left soldiers fearful of the surgeons, especially the younger, more inexperienced doctors who were overly enthusiastic to perform amputations. These zealous surgeons, nicknamed “butchers” by the soldiers, were sometimes criticized by the more experienced doctors and were accused of using the battlefield as a way to improve their skills instead of having the patient’s best interest in mind (U.S. Library of Medicine 2013). Amputation Being Performed in a Hospital Tent, Gettysburg (Tipton 1868–1925). Unfortunately, many amputations during the Civil War resulted in infection from lack of sterilization which inevitably lead to death. Tourniquets continued to be used on and off the battlefield to help stop the flow of blood on an open wound or to perform an amputation. A historical account from World War II states that, once again, tourniquets were being misused, sometimes resulting in unnecessary amputation. “Soldiers—whether medical or non-medical—regularly misused tourniquets. They applied them unnecessarily; left them unloosened for too long; and occasionally evacuated patients with tourniquets concealed by blankets or clothing, and hence not discovered until the limb was doomed” (Welling and Rich 2012). A modern version of the tourniquet is still used today but with much greater care and awareness on the part of the medical professional administering the device. 1879 A System of Surgery. Hahnemann Publishing House, Philadelphia, Pennsylvania. 2006 Tourniquet Use on the Battlefield. Electronic document, https://academic.oup.com/milmed/article/171/5/352/4577893, accessed May 2018.
n.d. The Civil War Period Amputation and Surgical Sets Collection. Electronic document, http://medicalandsurgicalantiques.com/the-civil-war-period-collection.html, accessed May 2018. 1868–1925 Amputation Being Performed in a Hospital Tent, Gettysburg. Glass Negatives of ‘Tipton’s Photographic Views of the Battle of Gettysburg and other Photographs of General Interest”, 1868–1925. Available online https://catalog.archives.gov/id/520201, accessed May 2018. 2013 Maimed Men. Electronic document, https://www.nlm.nih.gov/exhibition/lifeandlimb/maimedmen.html, accessed May 2018. 2012 A Brief History of the Tourniquet. Electronic document, https://www.jvascsurg.org/article/S0741-5214(11)02470-0/pdf?code=ymva-site, accessed May 2018. In June 2017, Dovetail conducted excavations on the grounds of Tudor Place, a historic Federal-style mansion in the Georgetown neighborhood of Washington, D.C. The excavations focused on an area immediately west of the main house known as the west service yard. This portion of the property currently contains a gazebo, ornamental arbors, a smokehouse (later used as a pigeon coop), and a patio area. Because Tudor Place staff has plans to renovate the structures and landscaping in this portion of the yard, Dovetail was asked to conduct archaeological investigations to ensure that no significant archaeological deposits would be disturbed. This was also an excellent opportunity to learn more about land use in this part of the Tudor Place property. Figure 1: Glass syringe plunger found at Tudor Place. The medical use of syringes has a fairly long history, dating back to the 1st century A.D., when they are described by Celsus in his comprehensive treatise on medicine, “De Medicina.” At this time, syringes were used for suction rather than for injection, and Celsus describes using them to remove discharge from patients’ ears (Feldmann 1999). By the seventeenth century, experimentation with intravenous injections was taking place, although the equipment used was large and cumbersome compared to modern syringes, with one early apparatus described as being no more than a “quill attached to a small bladder” (Macht 1916:857). These types of devices required the doctor or surgeon to make a separate incision through which to insert the apparatus. In 1844, an Irish surgeon named Francis Rynd invented a hollow needle for hypodermic administration of drugs using a gravity-fed system, and in 1853, Alexander Wood began using hollow, pointed needles which could easily pierce the skin with little pain or bleeding. In the same year, Charles Pravaz independently developed a needle and syringe that would become the prototype for modern equivalents (Macht 1916). Figure 2: A glass syringe without a needle attached (eBay 2017). The question is, what is a syringe doing at Tudor Place? Well, the history of the property shows that it might not be such an unexpected find after all. It turns out that Dr. Armistead Peter operated a medical practice out of the east wing of Tudor Place from 1867 until 1882. Dr. Peter was a fairly well-known physician in Washington and, being versed in the latest medical developments and treatment procedures, would likely have used syringes like the one invented by Pravaz. During this time, one of the most common uses of syringes was for the injection of morphine and related drugs, and Dr. Peter may have used the syringe recovered by Dovetail to treat pain in one of his patients. Of course, since we don’t know for sure that this was a hypodermic syringe with a needle, it is also possible that it was used for some other purpose such as irrigating a wound or draining fluid from an infected area. Although we may never know exactly how this syringe was used or why part of the device was deposited along the edge of the west yard, this rather unusual artifact certainly injected a little excitement into our excavations! Figure 3: Dr. Armistead Peter. Image courtesy of Tudor Place. 2017 Electronic document, http://www.ebay.com/itm/Antique-Wood-Cased-Glass-Doctor-Medical-Syringe-Glass-Plunger-Original-RARE-/142428023312, accessed July 13, 2017. 1999 2000-year history of the ear syringe and its relationship to the enema. Images from the history of otorhinolaryngology, represented by instruments from the collection of the Ingolstadt Medical History Museum. Laryngorhinootologie 78(8):462‒467. 1916 The History of Intravenous and Subcutaneous Administration of Drugs. Journal of the American Medical Association LXVI:856‒860. Filed Under: Archaeology, Artifact, Glass, Historic Tudor Place and Gardens, Medical, Nineteenth Century Tagged With: archaeology, Artifact, Medical, Washington D.C. In the fall of 2012 Dovetail Cultural Resource Group (Dovetail) conducted a data recovery excavation on a mid-eighteenth through late-nineteenth century domestic site (7NC-F-135/Armstrong-Rogers) in New Castle County, Delaware. The data recovery was sponsored by the Delaware Department of Transportation (DelDOT) and the Federal Highway Administration (FHWA) as part of the DelDOT Route 301 study. Over 6,500 artifacts were recovered during the excavation, one of which was a copper alloy fleam cover (pictured below). Fleam Cover From Dovetail Excavation of Site 7NC-F-135. Fleams (pictured below), also known as bloodletting devices, were used in the historic medical practice of bloodletting. This instrument was a folding handheld device (much like a pocket knife) with several blades or lancets sharp enough to cut the median cubital vein at the elbow (Greenstone 2010). Once the blood flow began, a bowl known as a ‘bleeding bowl’ was placed under the arm to catch the blood. Bloodletting as a medical practice is thought to have begun with the Egyptians around 3,000 years ago and grew in popularity throughout the centuries peaking in the nineteenth century (Greenstone 2010). During the third century B.C. a Greek physician named Erasistratus thought that all ailments stemmed from an excess of blood (Cohen 2012). By the second century A.D., Galen of Pergamum, also a Greek physician, believed that an illness was the direct result of an imbalance of the four “humors”, represented by liquids in the body, and the best way to restore balance was by bleeding (Cohen 2012). Furthermore, Pergamum believed each humor to be associated with the essential elements of air, water, earth, and fire as well as the four seasons of the year. Complete 5-Bladed Fleam (Ebay 2017). The art of bloodletting became as ubiquitous as antibiotics are today in medieval Europe where physicians and even barbers began using the fleam, which at the time was an iron rod with a sharpened point that would get ‘hammered’ into the vein (Cohen 2012). In 1978 Saturday Night Live aired a satirical sketch (shown below) on bloodletting called “Theodoric of York: Medieval Barber.” During the sketch Theodoric orders 2 pints of blood to be removed from a sick woman stating: “Isabel is suffering from an imbalance of bodily humors” (Martin 1978). In the sketch the woman died, not unlike many real patients who were subjected to bloodletting. Bloodletting continued through the years with historical figures such as Marie-Antoinette and George Washington reportedly being subjected to bloodletting. By the late-nineteenth century new medical practices were being discovered and luckily bloodletting as a treatment for all ailments became less frequent. While used today for conditions such as hemochromatosis (disorder leading to abnormal iron accumulation in organs) and polycythemia vera (stem cells bone marrow disorder causing red blood cell overproduction), we can count on never having to hear our doctor say: “you are in need of a good bleeding; let’s take 2 pints” (Greenstone 2010). Reproduction of European Medieval Fleam and Bowl Based on Archaeological Finds at The Abbey Of Saint Eutizio, Italy (N.R.C. 2017). 2017 Antique Baldinelli Veterinary Blood Letting Brass Cased Fleam. Electronic documentation, http://www.ebay.com/itm/Antique-BALDINELLI-Veterinary-Blood-Letting-Brass-Cased-FLEAM-5-Blades-Tools-/282525911312, accessed June 2017. 2010 The History of Bloodletting. British Columbia Medical Journal (BCMJ) 52(1):12‒14. Electronic documentation, http://www.bcmj.org/premise/history-bloodletting, accessed June 2017. 1978 Theodoric of York: Medieval Barber. Saturday Night Live: Season 3. Electronic document, http://www.nbc.com/saturday-night-live/video/theodoric-of-york/n8661?snl=1, accessed June 2017. 2017 Reproduction of European medieval bloodletting and cautery tools based on archaeological finds at the abbey of Saint Eutizio, Italy. Image source: Medieval Design. In Pinterest [Personal Page]. Electronic document, https://www.pinterest.com/pin/132152570287486399/, accessed June 2017.
limited English proficiency, contact our office at 540-899-9170.